Mopec provides first-class laboratory solutions and equipment to the pathology, anatomy, mortuary, and necropsy industries. With 25 years of experience, Mopec has grown to become a global company that services over 80 countries. They strive to enhance facilities’ flexibility and productivity while providing high-touch craftsmanship and service. Mopec needed two videos to promote their revolutionary products and called on Media Genesis for the job. 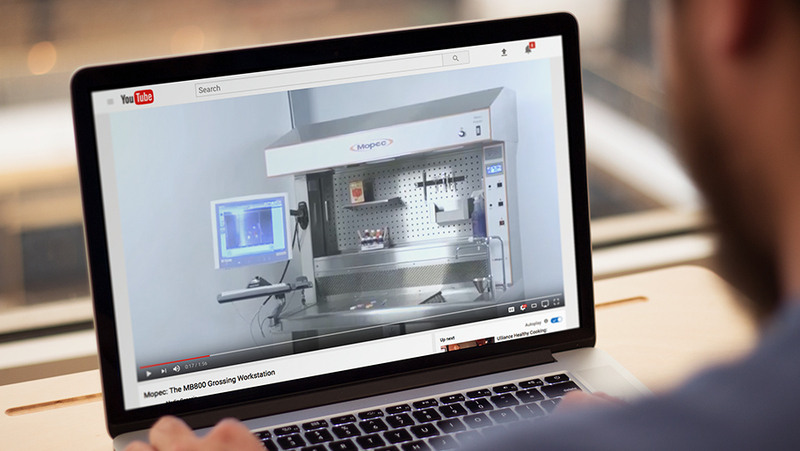 The goal of the videos was to promote two of their new products: the Autopsy Saw 5000 and the MB800 Grossing Workstation. Mopec wanted each video to highlight the benefits of the equipment and its main features. The videos were ultimately intended for Mopec’s marketing campaigns, but needed to be versatile enough to use for other purposes, such as social media messages and outreach on the website. Before filming and production began, we met with Mopec to gain a better understanding of their mission, key audiences, and core messages. From this discussion, we identified the basic layout of each video and developed a storyboard. Throughout the process, Mopec was involved at every step and approved our artistic vision as it came to life on paper. With the storyboard in place, our team wrote and edited the script that would be used for the voiceover. We recorded the voiceover and edited the sound for the final piece. After the foundation for the video layout was finalized, it was time for our film crew to jump into action and gather footage. Our team visited the Mopec lab and met with their team to film the equipment. This included shooting the Workstation and Autopsy Saw from multiple angles, capturing close-up images, and filming the equipment in use. We added the visuals and audio together to create two videos that seamlessly detailed all the characteristics of the two pieces of equipment. The videos were used for Mopec’s marketing campaign and Mopec hopes to film any future videos with us.